At ProImpact, we believe in educating our patients and their parents / caregivers on their particular injury. On this page, you will find articles that were carefully and purposefully selected. We feel each article clearly explains the topic being discussed and hope you will agree. Each category is specific to the general area of the body. Within each category, you will find subcategories that list case studies specific to various injuries. Links to the full articles and their websites are listed in addition to the information provided. This is information from the Mayo Clinic website; a link to the full article will be linked below. This is information from the Move Forward website; a link to the full article will be linked below. This information is from the Move Forward website; a link to the full article will be linked below. This information is from an article on the ShoulderDoc website; a link to the full article will be linked below. 1. A beach chair or lateral position can be used. 2. The arthroscope is place in the posterior portal and a needle is passed from anterior through the biceps tendon. A suture is then passed through the needle, captured with a grabber from the anterior portal and then extracted. This is to ensure the tendon does not drop down the arm when it is cut. 3. After the tendon is marked with a suture, an arthroscopic scissor is then used to cut the tendon from its origin. 6. The tendon is trimmed and a non-absorable suture is place in the top of the tendon. A guide wire and reamer is then used to make a deep bone tunnel in the humerus. If you would like to watch an educational animation of the surgery, please click the link below. This is information from the Academy of Orthopaedic Surgeons website; a link to the full article will be linked below. This information is from an article on the MoveForward website; a link to the full article will be linked below. This is information from an article written by Brian Cammarota, a Physical Therapist, a link to the full article will be linked below. Your doctor will know and advise when surgery for a torn rotator cuff is advisable. If you have sought after secondary treatment and pain has not subsided, or it has gotten worse, surgery might be the only option. Furthermore, if you do things on a daily basis that requires having your arms overhead, your doctor will most likely recommend surgery. This is information from the WebMD website; a link to the full article will be linked below. This information is from the WebMD website; a link to the full article will be linked below. Some people can have rupture of their biceps muscle as part of this continuing impingement process. Images of myositis ossificans can be seen in radiographs provided at the sites below. The suprascapular nerve innervates the infraspinatus and supraspinatus, which are components of the rotator cuff that respectively externally rotate and abduct the arm. When damage or compression occurs to the suprascapular nerve, the brain is unable to transmit signals to the muscle to contract properly and this presents as weakness. It has been known to occur in individuals who perform a lot of overhead motions or in people with involved rotator cuff tears. Any kind of traction (stretch) or compression to the nerve, however, can cause this kind of nerve palsy. This could include cysts or bone spurs. Typically the compression occurs in scapular notches where the nerve travels.The first line of treatment for suprascapular nerve palsy is typically physical therapy, where you and your therapist will work on neural mobility and strengthening weakened or atrophied muscles. You will retrain the shoulder mechanics to ideally prevent this from occurring again. Surgical options are discussed to remove compression on the nerve from something like a cyst, but may also be considered if the pathology has been occurring for a long time. Surgery may also be an option if there are more tissues involved, like rotator cuff injuries or bony overgrowth. The first line of treatment for suprascapular nerve palsy is typically physical therapy, where you and your therapist will work on neural mobility and strengthening weakened or atrophied muscles. You will retrain the shoulder mechanics to ideally prevent this from occurring again. Surgical options are discussed to remove compression on the nerve from something like a cyst, but may also be considered if the pathology has been occurring for a long time. Surgery may also be an option if there are more tissues involved, like rotator cuff injuries or bony overgrowth.Physical therapy for suprascapular nerve palsy focuses on gaining or maintaining full active range of motion of the shoulder. This may involve retraining muscles to work synchronously and teaching shoulder biomechanics to ensure the injury does not reoccur, Afterwards, you will begin to strengthen the shoulder girdle to allow you to return to your normal activities. Physical therapy for suprascapular nerve palsy focuses on gaining or maintaining full active range of motion of the shoulder. This may involve retraining muscles to work synchronously and teaching shoulder biomechanics to ensure the injury does not reoccur, Afterwards, you will begin to strengthen the shoulder girdle to allow you to return to your normal activities. “Calcific tendonitis refers to a build-up of calcium in the rotator cuff (calcific deposit). When calcium builds up in the tendon, it can cause a build up of pressure in the tendon, as well causing a chemical irritation. This leads to pain. The pain can be extremely intense. It is one of the worst pains in the shoulder (the other being Frozen Shoulder ). In addition to the chemical irritation and presssure, the calcific (calcium) deposit reduces the space between the rotator cuff and the acromion, as well as affecting the normal function of the rotator cuff. This can lead to subacromial impingement between the acromion and the calcium deposit in the rotator cuff when lifting the arm overhead. This is information from the Spine-health website; a link to the full article will be linked below. “Dysfunction in the sacroiliac joint, or SI joint, is thought to cause low back and/or leg pain. The leg pain can be particularly difficult, and may feel similar to sciatica or pain caused by a lumbar disc herniation. Physical Examination: your doctor may try to determine if the sacroiliac joint is the cause of pain simply by moving it. If that movement triggers the pain and no other symptoms trigger the pain, that may indicate the SI joint is the problem. An Injection to block pain: It takes a highly skilled and experienced physician to be able to insert a needle into the correct portion of the sacroiliac joint. Because of this, the injection is usually guided by X-ray to make sure the joint is properly injected. Sometimes a dye is injected so that the joint is better visualized, which is called an arthrogram. This is information from the Washington University School of Medicine website; a link to the full article will be linked below. Winged scapula is characterized by the shoulder blade abnormally sticking out in the back. A main potential cause for this injury is compression or injury to the long thoracic nerve. The resulting injury of a winged scapula can be painful due to the decreased ability to shrug the shoulder. This is information from the HealthyChildren.org website; a link to the full article will be linked below. This is information from the Joint Paint Expert website; a link to the full article will be linked below. Type 1 fracture may present as elbow pain only without any swelling. This is information from the Sports Injury Clinic website; a link to the full article will be linked below. Pain about 1 to 2 cm down from the bony part on the outside of the elbow, known as the lateral epicondyle. Also, there may be associated weakness in the muscles around the forearm and wrist and this may cause difficulty in performing simple tasks such as opening a door handle or shaking hands with someone. A doctor or professional therapist may perform a number of assessment tests to help diagnose lateral epicondylitis. This is information from the Mayo Clinic’s website; a link to the full article will be linked below. Golfer’s elbow refers to the pain that occurs where the flexor muscles of your forearm attach to the inside of your elbow. The pain may also spread down the forearm and into the wrist. This type of pain can be seen in all types of patients who repeatedly use their wrist or fingers, regardless if they play golf or not. Symptoms include: numbness or tingling sensation radiating into the fingers, stiff elbow, weak hand or wrist, and pain or tenderness on the inside of the elbow. This is information from the PhisioAdvisor website; a link to the full article will be linked below. This is information from the Sock-Aid website; a link to the full article will be linked below. This is information from the Medscape website; a link to the full article will be linked below. This is information from the Houston Methodist website; a link to the full article will be linked below. This information is from the Mayo Clinic website; a link to the full article will be linked below. Pain. Mild to moderate pain in the knee can cause a slight limp or difficulty walking. Swelling. Knee swelling occurs rapidly, within hours of the injury. Instability. Your knee may feel loose, as if it’s going to give way. This is information from the Radiopaedia website; a link to the full article will be linked below. This is information from the Health Fix It website; a link to the full article will be linked below. What Symptoms will Patellar Tendonitis provide? This information is from the AAOS website; a link to the full article will be linked below. Pain during exercise and activities that repeatedly bend the knee, such as climbing stairs, running, jumping, or squatting. Pain after sitting for a long period of time with your knees bent, such as one does in a movie theater or when riding on an airplane. Pain related to a change in activity level or intensity, playing surface, or equipment. This is information from the E-Pain Assist website; a link to the full article will be linked below. What Causes Synovial Plica Irritation? This information is from the E-Pain Assist website; a link to the full article will be linked below. Dysfunction of the patellofemoral joint due to overuse, injury or abnormal mechanics. Direct trauma to the knee such as dashboard injuries or falling onto a flexed knee or twisting injuries and overuse of the joint may cause irritation. Other knee joint conditions such as a meniscal tear or arthritis could also result in plica irritation. Anything that causes bleeding in the joint or synovitis can also lead to plica irritation. This is information from the Arthritis-health website; a link to the full article will be linked below. 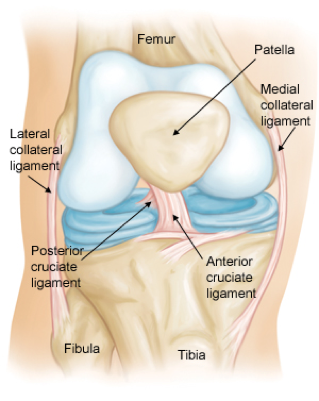 Patellar tendinitis, also known as Jumper’s Knee, refers to the injury of the patellar tendon. The patellar tendon extends from the knee cap to the shin and helps to extend the knee. Overuse and excessive stress on the patellar tendon is the usual cause of this injury, and pain is typically the first symptom. This excessive stress can cause small tears within the tendon. References 1 and 2 are listed below, respectively. This is information from the OrthoInfo website; a link to the full article will be linked below. Deep Vein Thrombosis (DVT) occurs when a blood clot forms in a deep vein of the body. DVT’s most commonly occur in the legs and a risk factor includes having arthroscopic surgery of the knee or hip. Although relatively uncommon in patients following arthroscopic surgery of the leg, a DVT may lead to a pulmonary embolism which causes the heart and lungs to fail and may result in death. Some signs of a DVT include: swelling, pain or tenderness, distended veins, red or discolored skin, and a firmness of the vein like a “cord”. Signs of pulmonary embolism include shortness of breath, coughing, sudden onset of chest pain, and spitting up blood. If you experience any of these symptoms, contact your physician immediately. In order to diagnose a DVT, Duplex ultrasound is used, which allows doctors to be able to see the blood flow throughout your body. Participation in physical therapy and early movement following surgery have shown to decrease the risks of developing DVT’s by improving blood flow through the veins of your legs and body. Using graded elastic compression socks or compression devices following surgery may also promote blood flow to the legs and prevent DVT’s. Your doctor may prescribe blood thinners, called anticoagulants, to decrease the risk of a DVT or to treat a developed DVT. Posted below are additional resources on information about DVT’s following arthroscopic surgery. This is information from the Johns Hopkins Medicine website; a link to the full article will be linked below. Pain is usually felt around the ankle joint itself although more specifically on the outside of the ankle where the damaged ligaments are located. Swelling or bruising may present immediately or may take up to 48 hours to develop (depending on the types of structures damaged and the severity of the sprain). It should also be noted that in milder cases, this may never appear at all. Sprains are graded 1, 2 or 3 depending on their severity and a professional therapist will be able to tell you which grade of injury you have sustained after carrying out a full ankle assessment. This assessment will include a number of movement, muscle and ligament tests in order determine which structures have been injured and how badly. This is information from the Very Well website; a link to the full article will be linked below. This is information from the John Hopkins Medicine website; a link to the full article will be linked below. 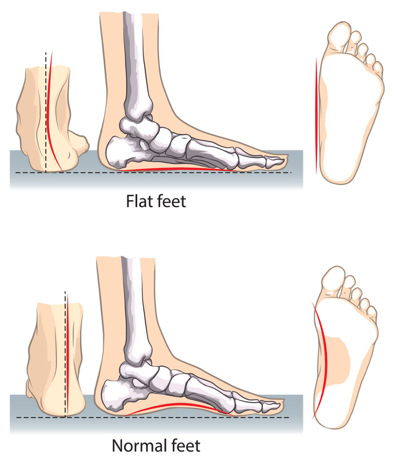 There are a lot of injuries we can get in our feet, but a good pair of shoes can help alleviate aches and pains and sometimes prevent certain injuries from ever developing.1 We recommend seeing a trained specialist at a running store that can help size you properly, analyze your walking or running, and help point you towards brands and models that may be a good fit for you. Everybody is different, and your shoes should reflect that! Comfort in standing, walking and running. Nothing should be squeezed or sliding in the shoe – your foot should sit comfortably.1 Test your new shoes out for 5-10 minutes to make sure they are comfortable beyond the first few steps! Different shoes are designed for different purposes and are often not suitable for other activities. For example, running shoes have more support and cushion in the back, but more flexibility in the toes. Walking shoes may be designed to bend through the ball of the foot. Cross trainers are suitable for exercise in the gym and other workouts.1 Shoes are designed from lasts that are engineered to cater to specific activities, and are made that way for a reason – trust the experts! If you have foot pain but work in an environment where supportive walking or running shoes are not an option, many brands will have models that are based on sneakers and will provide more support while still looking professional.1 These are good options for the work day – good foot support is important all the time! References 1 and 2 are linked below, respectively. This is information from the I Walk Free website; a link to the full article will be linked below. This is information from the New York Times Health Guide website; a link to the full article will be linked below. The sciatic nerve travels from the lower back region of the body down through the leg. When pain radiates from this nerve, this is known as sciatica. Symptoms include numbness, pain, and possible inflammation and are usually only present on one side of the body. Charcot Marie Tooth (CMT), also known as Hereditary Motor Sensory Neuropathy (HMSN) or Peroneal Muscular Atrophy, is one of the most common inherited neurological disorders. This disease affects the structure and/or function of nerves or the conduction sheath covering them, slowing down nerve impulses. In addition, there are motor and sensory symptoms associated with the disorder; including but not limited to, weakness in hands/feet, very high or low foot arches, numbness, and pain. Diagnosis of CMT involves a physical exam including muscle testing, observation of walking, and reflex testing. Physical therapy is among many of health professionals that can help improve quality of life in those with CMT by having the capability to improve pain levels and functioning. Complex regional pain syndrome (CRPS) is a chronic pain condition that typically occurs secondary to tissue trauma or surgery but can occur with a lack of injury in rarer cases. CRPS occurs in females 3-4 times more than males, in upper extremities more than lower, and usually around 50-70 years of age2. There are two subtypes of CRPS: the more common Type I or reflex sympathetic dystrophy (RSD), and Type II or causalgia. The neuropathic pain associated with CRPS is disproportionate to the stimulus actually occurring to tissues1. At the site of tissue trauma, pain receptors become sensitized to stimuli. Abnormal messages are then transmitted to the brain relaying a message of a constant painful stimulus, resulting in central sensitization and abnormal mapping at the sensory detection center, or somatosensory cortex. In addition, there is an increased sympathetic nervous system activation, which can cause symptoms such as sweating, temperature, and/or hormonal changes2. Other symptoms associated with CRPS include, but are not limited to, limited mobility and strength, pain, redness, and swelling at the site of tissue injury1. Treatment for RSD or CRPS should include an interdisciplinary approach of healthcare providers, including physical therapy to help normalize stimuli and decrease symptoms. Exercises given to help treat CRPS are individualized to the patient and should be performed frequently. Erb’s palsy is a form of brachial plexus palsy. It is named for one of the doctors who first described this condition, Wilhelm Erb. The brachial plexus is a network of nerves near the neck that give rise to all the nerves of the arm. These nerves provide movement and feeling to the shoulder, arm, hand, and fingers. Palsy means weakness, and brachial plexus birth palsy causes arm weakness and loss of motion. It is often caused when an infant’s neck is stretched to the side during a difficult delivery. Most infants with brachial plexus birth palsy will recover both movement and feeling in the affected arm, often with daily physical therapy exercises. Contrary to the belief that arthroscopies, or “scopes” for short, are performed on minimally damaged anatomic structures, these surgeries can correct extensive abnormalities resulting in increased amount of postoperative physical training necessary. The damage to the cartilage of the knee can be seen at the end of the probe. 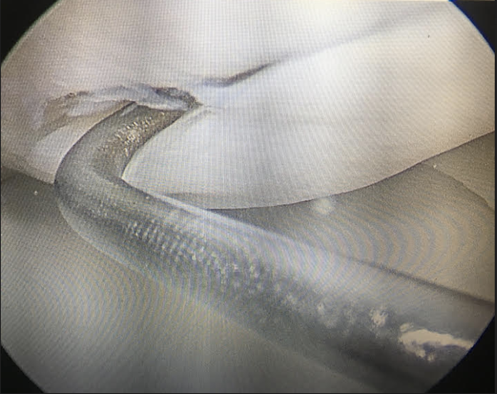 Despite this surgery being “just a scope,” the damage to the tissue is extensive. While considering an arthroscopic procedure for you or someone else you know, remember that the procedure itself does not identify the amount of structural damage present.